uBITX firmware CEC Version is based on uBITX which has not modified anything. Prior to deployment, the 16x02 LCD with built-in is tested first. Nextion LCD, TJC LCD, 20x04 LCD and I2C LCD are not essential for using uBITX Firmware CEC version. In order to view signals from Character LCD or Nextion LCD, Signal Meter Sensor must be installed. Of course, CEC Firmware operates normally even if S-meter sensor is not installed. Version 1.097 has been released. The link below contains installation instructions and basic usage, so this post will briefly explain the changes. 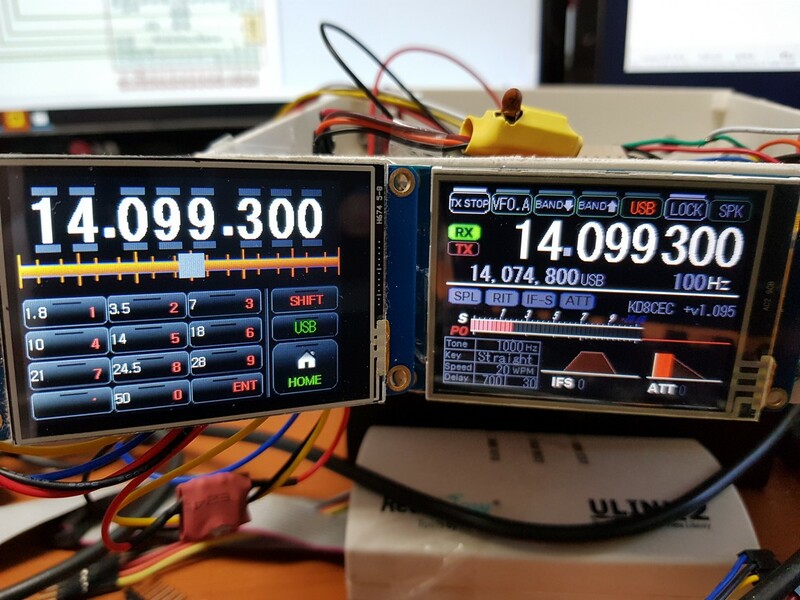 Two uBITX firmware are available for Nextion LCD (include TJC LCD). 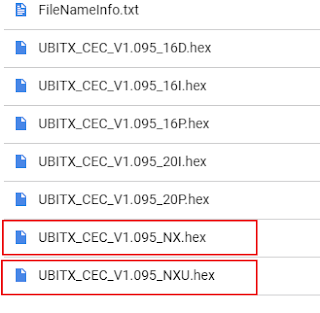 The file 'UBITX_CEC_V1.095_NX.hex' and the file 'UBITX_CEC_V1.095_NXU.hex'. Most of the features of both files are the same. 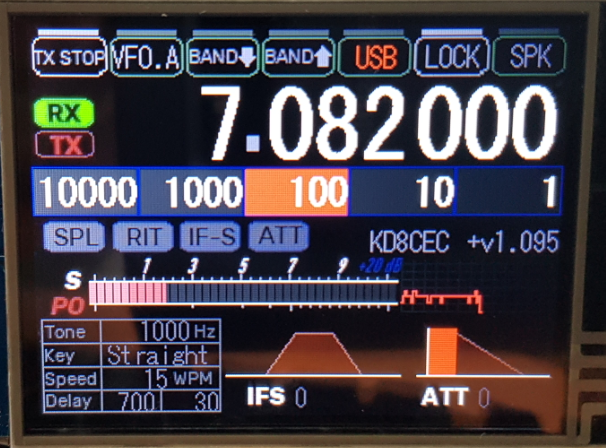 Nextion LCD (include TJC) can control uBITX's memory. 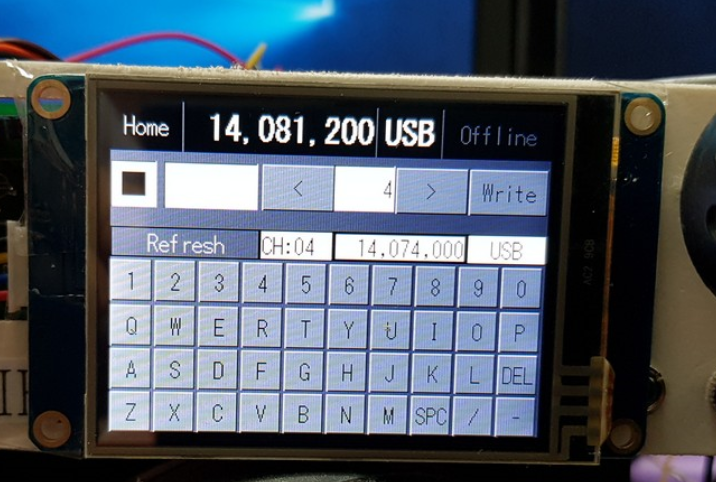 'UBITX_CEC_V1.095_NXU.hex' version can read and write all memory areas of uBITX on Nextion LCD. 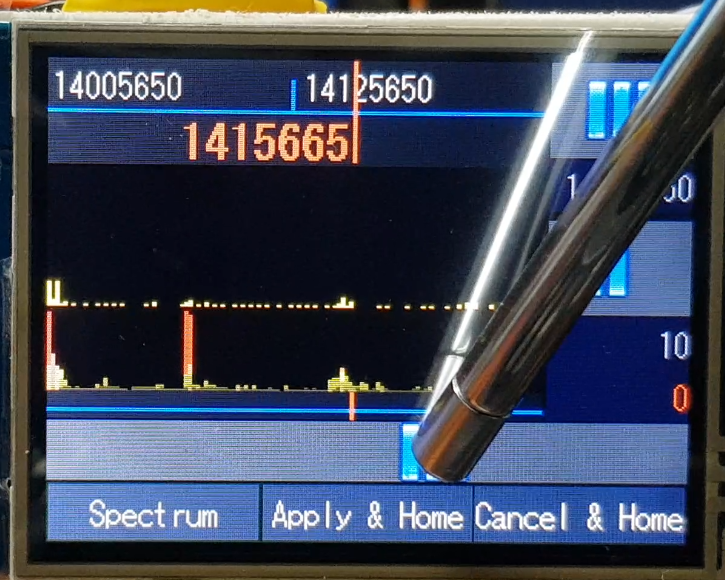 The 'UBITX_CEC_V1.095_NX.hex' version can read all the memory areas of uBITX on the Nextion LCD, but the writes can only be written to the 770~775 area. 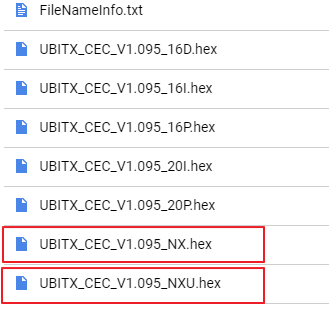 In order to use 'stored channel, load channel' added in this version, you can upload 'UBITX_CEC_V1.095_NXU.Hex' file. 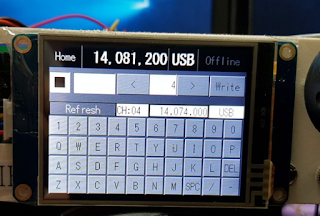 I have added 2.4".TFT files and uploaded again. If you are using 2.4", download again. 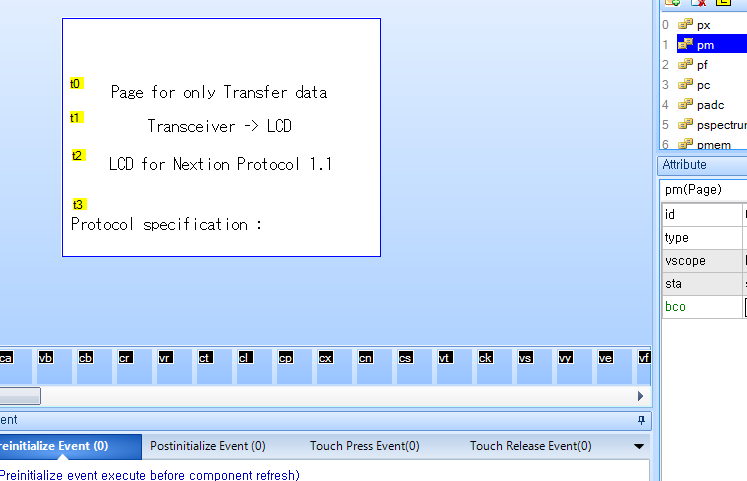 Nextion LCD GUI Template file for Developer, The Template file is a blank screen that only communicates with uBITX. Since uBITX firmware source files will continue to change, we will push to github when the beta period ends. Fixed a bug where changed frequency can not be applied when frequency is changed during split communication. I have made it possible to connect various devices that communicate UART to the LCD in parallel. Below is an example of connecting two LCDs in parallel. When connected in parallel, devices can communicate with each other using the added protocol. There are two ways to wake up from the screen saver. The first is to change the frequency by turning Dial. The CEC Firmware Version 1.095 and Version 1.094 calculates the time to switch to the screen saver as the time that the frequency stays unchanged. In Version 1.094, when you touch the screen to exit the Screen Saver mode, you are switched to the 'Main control' page at the same time you leave Screen Saver mode. In Version 1.095, only leaves Screen Saver mode. Please refer to the following link and video for the contents up to here. There was a feedback between the picture and the text that the font was different. 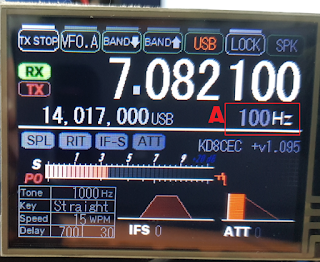 If you want to be displayed as the actual transmitted frequency, set the following in uBITX Manager. The actual transmitted frequency will be displayed on the screen. 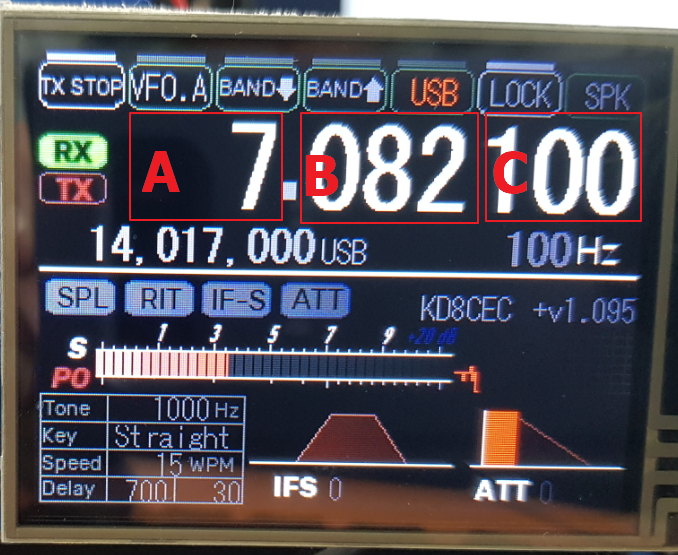 This feature is supported from Version 1.03, Nextion LCD and TJC LCD support this feature from this release. When Dial Lock is applied, The touch screen is also locked. 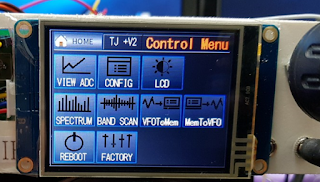 You can use any Nextion LCD or TJC LCD even if it is not Enhanced Model. I post a separate article about features that need clarification before deployment, but Version 1.095 is distributed in advance at the request of beta testers who want to test it. That's why I have not yet posted about the Memory feature. Please wait a day or two and we will post the contents related to memory. Thanks to everyone who tested the beta. If there is a serious bug in this version, I will patch it as soon as possible. The Thankful developers have converted to 3.2 ", 3.5", 5 ", 7", Thank you very much. Thanks to that, I can work fast on 2.8 ". I have tried not to change the protocol since Version 1.094, But I had to change a few things in this version, After a lot of worries, I added some global variables and changed the structure of the page. I know that this will cause embarrassment for GUI developers. However, we had to change it for future expansion and stability. I promise not to make such a big change in the future. I only had a month of GUI programming on Nextion LCD, So I did not know how to be more scalable and stable. As I learned the characteristics of the Nextion LCD, we felt the need to change to ensure stability and scalability. 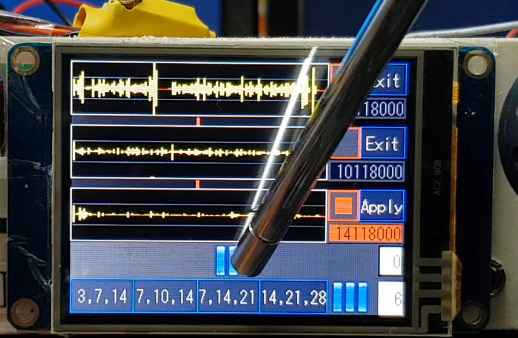 Nextion LCD has limited memory per page. I felt I needed to leave the Main VFO page a bit blank for future additions. So I moved the variables to receive data from uBITX to another page. The main VFO (page named 'px') now contains only the functions and variables for displaying data on the screen. I added a new page (pm). This page is dedicated to communication and should not be modified. And I have added variables for vq, vv, vk, vl, vm for communication. I appreciate the GUI developer's understanding. I also appreciate everyone using and testing the beta version. If you saw my earlier post, which I deleted, I made a mistake an used an older version of uBitx Manager software. I used the latest version and all the information was there in the right side of the software for setting the S-Meter and memories, etc. Sorry for my mistake. I have a question. Is there a possibility of being able to select your keying method in the first Menu options or via the touch screen without having to go into Menu > Setup to turn on Straight, Iambic A or Iambic B?? The reason I ask, is after putting a 4 pin mic plug on my rig, I know have a stereo jack for straight key and one for paddles then I have the headphone jack. Thanks again for such great work on these programs! of course, I did not put that feature in this version yet. I'll make it easy to change in the next version. Thank you very much. I look forward to that. I have no problem going thru Menu to change the CW speed. It would be nice to be able to select which type of keying you are using via Menu or on the screen. Where is the source for V 1.095? I have the Nextion 2.8 Enhance screen, haven't put a battery in it yet, but which file should I be using?? Not sure what the _NXU file is for, whether it is for the enhance version of the 2.8 or what. Thanks again and I promise no more questions tonight. The two files are the same. 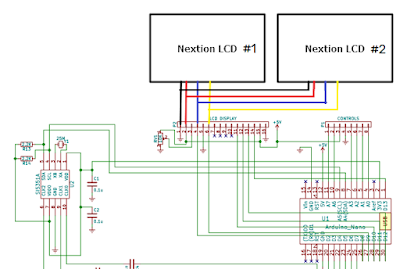 'xxx_NXU.hex' version can read and write all memory areas of uBITX on Nextion LCD. The _NX.hex version can read all the memory areas of uBITX on the Nextion LCD, but the writes can only be written to the A area. You can use _NX.Hex version for general use. In order to use 'stored channel, load channel' added in this version, you can upload _NXU.Hex file. You can also try uploading and testing the two alternately. It was a really good question. I'm missing what I'm describing. I'll add it to this article. Thanks Ian for that clarification. I need to find a way to access the micro SD card slot so I don't have to always take the top off and remove the raduino and then the display so I can insert the micro SD. Time to modify my enclosure. I am ordering a mini USB enclosure mount so I have a USB on the side of the enclosure. Again thanks for all the excellent work your doing. I am starting to learn how to program the HMI screen. It has been tough but starting to be more fun. 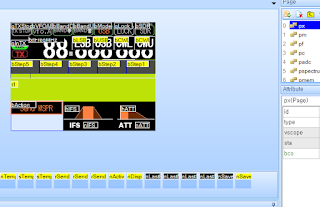 I am trying to resize the 2.8 hmi screen to a 3.2 and a 3.5 screen. It seems I have to resize each item on the menu. Is there an easier way to take the 2.8 in. hmi and select all items at once and resize it to a 3.2 or 3.5 screen? 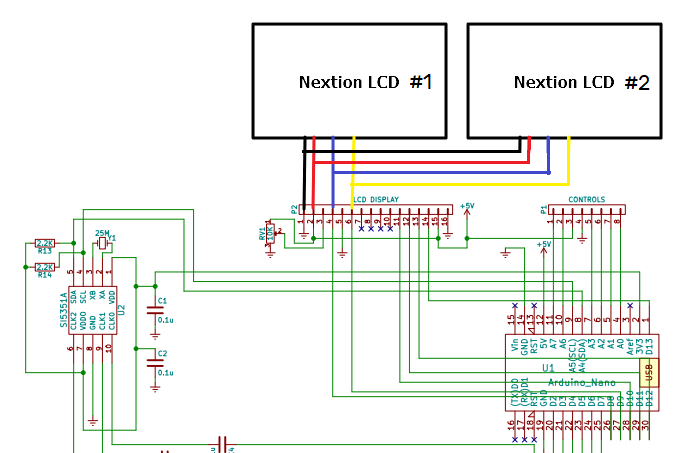 I just learned Nextion LCD. I know it probably is not. It seems to use the method of rearranging the components after importing the picture file again. Thank you for your good work and the share, Ian. I installed v1.095 NX, but step size cannot be changed on main screen. 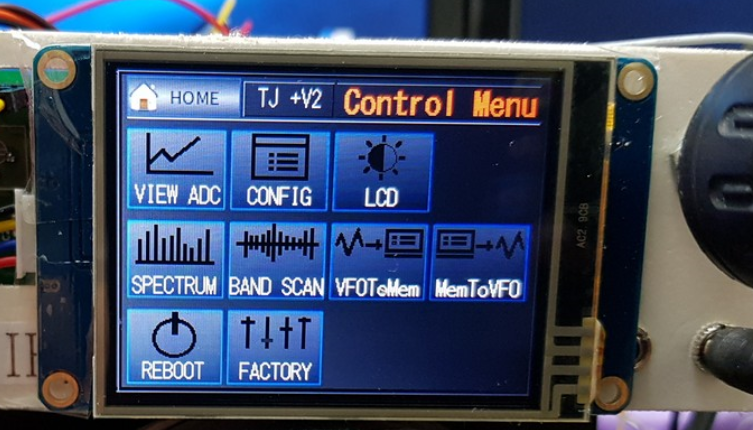 Have you upgraded the GUI firmware of Nextion LCD or TJC LCD? 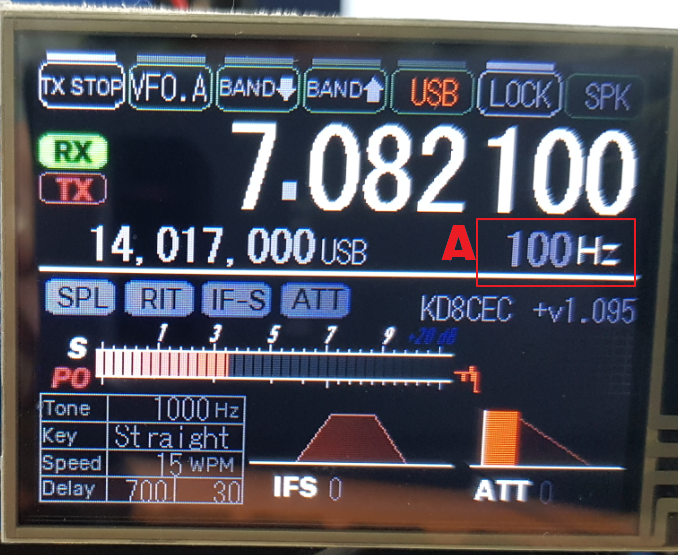 The uBITX firmware and the GUI must also be upgraded. If not, please contact me again. Itead 3.2" TFT 480x240 resistive touch screen display Nextion 3.2'' HMI LCD Display Module TFT Touch Panel for ESP8266. I am very new to all this and have been using the 1.08 version with great success. I copied the uBitx_32.tft from UBITX_Nextion_GUI_V2 onto a new PNY 16 Gig Memory module. The display powers up with the memory card not installed and works, but when I insert the card and power up the screen goes dark and nothing happens. I have tried another memory module with the same outcome. Can you point me in the right direction or what I may be missing. Any help would be greatly appreciated. I am glad that the problem has been solved. Really thankful, I know a lot of users with 3.5 "as many as 2.4" and 2.8 "users. Can you send this to mike at ubitx.net? 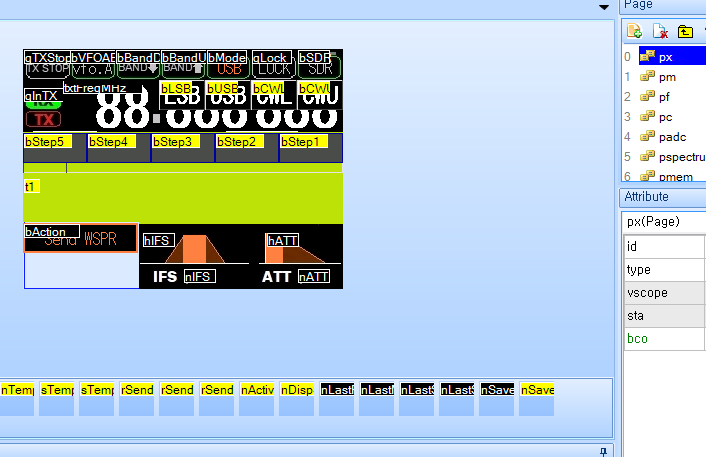 Now on ubitx.net, Nextion LCD's GUIs are arranged on one page for easy browsing. I think there will probably be a variety of GUIs on ubitx.net at the end of the beta period. I'll look forward to your wonderful work. Ian, I emailed the file via the info address and aimed it at Mike. I wasn't sure how to do it any other way. 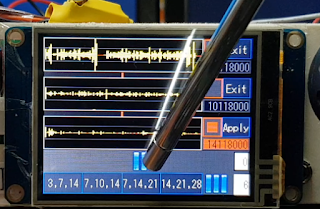 I installed on your file 3.5 your file and I noticed that it lacks the display of hundreds of KHz and hundreds of hertz. Have I made a wrong manipulation. Thank you for your work . thank you for rescaling the displaay for 3.5 in, which size I do have, too. Unfortunately there is lack of digits eg. 3699 shows 3 69 . I am not able to fix it myself, but perhaps you could? Hi all. Having trouble getting things to post this morning but I've uploaded the fix for the missing digits, it was a mask error. Thank you Ron . This is very good job. Ian is it possible to us a Function key to change the cw speed, so I can quickly change the speed. Or is it possible to use a potentio meter to directly change the cw speed? I'll put the feature in the next version. Using a potentiometer is difficult now because there is no extra ADC. Thank you for the wonderful software. Can I display it upside down? Maintenance is difficult because the micro-SD slot is at the bottom. I have not tried it yet, but I think it is possible. This function is supported by Nextion Editor. A really good Idea. Soon, I'll post a brief note on how to use .HMI files, I'll also post a way to flip it up and down. I consider to extent SD cable for change GUI. I did not know the micro-SD extension cable, but it is a good idea. On the other hand, I am also looking forward to flip display up and down method. Unfortunately, I still do not know how to factory reset the Nextion LCD. I had a problem that the command was not recognized at all. So I found a way to initialize all day but could not find it. But it was my mistake. I experimented with LCD and switched LCD to Extend mode. I realized my mistake and changed the configuration so it worked normally. First, you need to determine if your hardware is normal. You can find Factory Firmware at the following site. You will be able to test the touch of the LCD in Factory Firmware. Experiment this and let me know the results again. Just an update Ian. I have been running the 1.095 beta since I saw you released it. So far I have had no issues. I even found a free copy of HRD and downloaded it and hooked up to the uBitx and seems to work fine from the computer. Also, I have completed my s-meter circuit other than the capacitor. Seems I don't have one that will work, 0.30nf or 1.5nf. I have ordered one of each. I also left a comment on your blog on creating the s-meter using the LM358 chip. Boy that was really tough trying to solder those resistors, diode onto the chip socket!!! Hopefully I have it done with no shorts! But just wanted to let you know that the beta firmware is working fine on my Nextion 2.8 Enhanced display. Do you have an extra Arduino Nano? I am experimenting with another S-Meter using the Arduino Nano. Ian, I do not have another Arduino Nano, but have thought about ordering a couple. I have searched eBay and found some. Do you have a recommendation?? I just put the Nextion 3.5 "display. Thank you for the wonderful software. Really thank you for all your hard work. Thanks for using CEC Firmware. Thank you Ian for all your work, it's fantastic. I have your software controlling my ubitx with a Nextion 3.2in touchscreen and I just love it ! I am preparing a post for a new version. I missed the link to the actual firmware to download. Sorry. 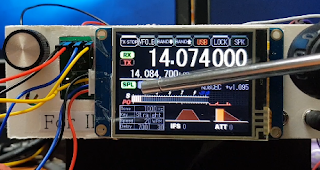 Do you think it would be possible to use an I2C LCD and a Nextion at the same time? I have one of Sunil's cases. I was planning on putting the Nextion in an external case. 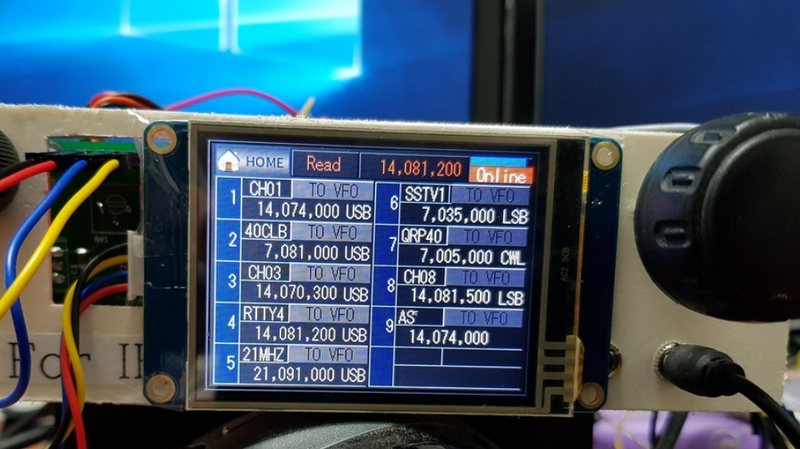 It would be great if the radio would work standalone with the I2C LCD I have installed in it as well as with the external TFT when it is plugged in. Is there a problem that would prevent this (like available size in the Nano)? For now it is difficult. It seems that you can use one more Arduino nano. 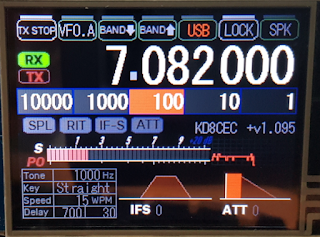 Nextion LCD supports Multi LCD by default. If we can implement Nextion LCD protocol emulation in Arduino Nano, it will be possible. Do you have a firmware file for the NX4832T035_011 and the _011R. Today i checked this web to see if you have any time to give an advice and I got this. please if you have any advice, help me. Thank you for your great work on the Nextion. I'm not great on Arduino, but followed your instructions and after about 8 hours work, my display lit up and worked on the uBit-x. I downloaded the latest firmware, and my 2.4 display seems to be doing everything. Next is the sensor. Thanks again. PS. is there any way to switch from the 2.4 mounted on the radio to an external 7 " screen or would you have to reflash firmware each time? 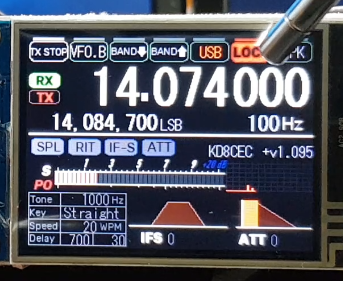 I am making a 5" layout and want to expand the bandscanner with width to show over about 600 pixels. I already figure out expanding the white, red and black lines that make up each bands spectrum line, I even was able to adjust them vertically. But I cant get the yellow drawing of the spectrum to stretch. It doesnt seems like a pixel width setting. Can you please help me. I could send you the hmi file. uBITX with Nextion LCD (CEC Firmware) - Installation and Introduction uBITX CEC Firmware supports various LCD since Version 1.08 (16x02 Parallel, 20x04 Parallel, 16x02 I2C, 20x04 I2C, 16x02 Dual LCD with I2C). Supports Nextion LCD (Graphic LCD) from Version 1.09, Version 1.09x is primarily aimed at Nextion LCD support. Also 1.09x will continue to be Beta version. If you want a stable version, please use 1.08 or 1.1 version to be released in the future. uBITX is based on Arduino Nano. So uBITX's firmware upgrade method is the same as Arduino. There are two ways to upgrade the firmware of uBITX. The first is to compile the source from the Arduino IDE, and the second is to upload the compiled hex file using the Firmware Upgrade Tool. I'll show you how to upload a compiled hex file as a second method. 1.Connect the uBITX's USB cable to the computer. 2.Run Device Manager on your computer. The way to open the Device Manager for each OS Version differs slightly. In most Windows, you can easily launch the Device Manager by running. On your computer, press the Windows key + R.
Type devmgmt.msc and press OK Button. On most operating systems, there will be a serial port named Ports with CH340. If so, the next step is skipped. If the serial port is not installed as below, you need to install the driver. Included in uBITX is the Adonano, which uses the CH340 USB To UART part. Download the latest CH340 driver from the Internet.